Where are all the spiders when you need one? 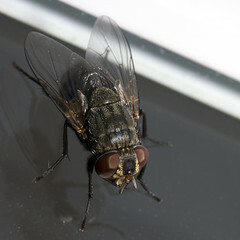 When I was younger, I would happily kill a fly with one adept swing of the fly swat. If no more specialised weapon was available, a rolled-up newspaper would do. I spent my teenage years in a house near a small German forest. Every summer swarms of fat houseflies would pour in the minute you opened the windows – which you had to do as in the middle of that continental landmass, the weather was often unbearably hot. Returning home from school each afternoon, I’d quickly build up a double-figure score before starting my homework. My aversion to flies may have had something to do with my sixth form Biology genetics project: bringing home a jam jar full of fruit flies, feeding them mashed banana, then anaesthetising them with ether to count how many had curly wings and how many had straight wings. Give ether to a schoolgirl? I hear your horrified cry. Surely that’s asking for trouble? This was of course the good old days, before health and safety regulations took over. But as my memory of the awful stench of etherised, banana-stuffed fruitflies has diminished, so has my eagerness to kill flies. These days I’ll shoo them out the window if possible, but our current visitor is most uncooperative. Nor can I kill anything else (as my friends and relations will no doubt be pleased to hear). My attitude on seeing roadkill is much the same as my horror at seeing dead bodies on the news: “Oh no, that’s some mother’s son!” I think I must have watched too much of Johnny Morris‘s “Animal Magic” TV programme when I was a child: I anthropomorphise far too easily. So I’m dependent now on the appetites of an itinerant spider – of which there is currently no trace. A couple of months ago, you couldn’t enter a room without finding a spider – or sometimes a dozy wasp or a ladybird. I can’t kill spiders either, thanks to the indoctrination by my kindly elderly neighbour who abided by ancient country sayings. “If you want to live and thrive, let the spider keep alive,” she often told me. Up to a point, I’m happy to maintain peaceful coexistence with a spider.. I’m no arachnaphobe, but nor do I want long-term spidery lodgers. 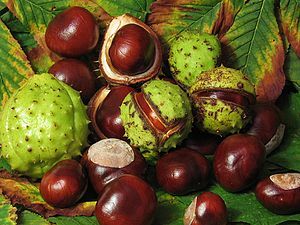 I have therefore applied with great success the rural remedy of leaving conkers about the house, which spiders cannot tolerate. But in the meantime, a bigger problem has arisen in our camper van. We’ve acquired a couple of mice. At least our new kitchen lodger is flying solo, so we don’t have to worry about it breeding – but a pair of mice? Hmm. Now, where can I get a hungry cat?